Bachmann: Trump Was Sent To Us By Jesus [VIDEO] - Joe.My.God. “Two years ago, I believe that the prayers that God’s people made to ask God for his provision were heard. They were heard and granted and for two years, we have lived in an unparalleled golden time in the United States. We have a president who has made the most pro-life actions of any president ever. We have a president who has been the most pro-Israel president ever in the history of the United States of America. Our president has put the United States on a pathway of blessing. “We have the most pro-religious liberty president in the history of the United States, ever! Do you see what a golden day that we have been given? On every possible level, America is killing it. 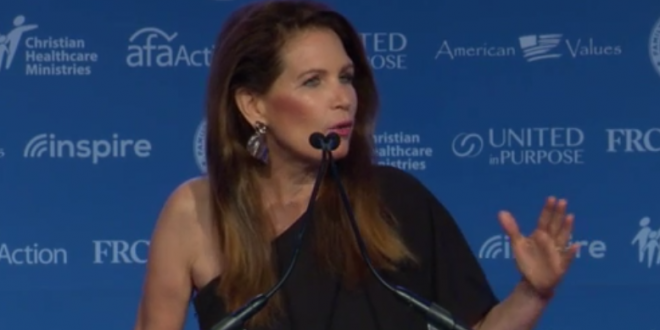 We are doing great in every possible metric, and I believe that’s because God’s people utilized the tool that he gave us.” – Former GOP Rep. Michele Bachmann, speaking this morning at the Family Research Council’s Values Voter Summit.